The Concept Of Innocence is a piece of digital artwork by Susan Maxwell Schmidt which was uploaded on March 22nd, 2015. 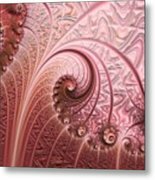 Conceptual fractal art of a beautiful abstract alien garden of delicate filigree flowers in shades of blush pink, rosaline and coppery salmon pink, with cocoa brown accents, blooming under a filigree sun. 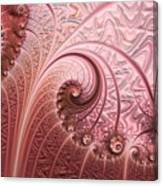 This artwork is available in a variety of framed and unframed gallery-quality giclee prints, home decor items such as velvety soft duvet covers, fabric shower curtains, and square and rectangular decorative throw pillows, as well as greeting cards and tote bags. 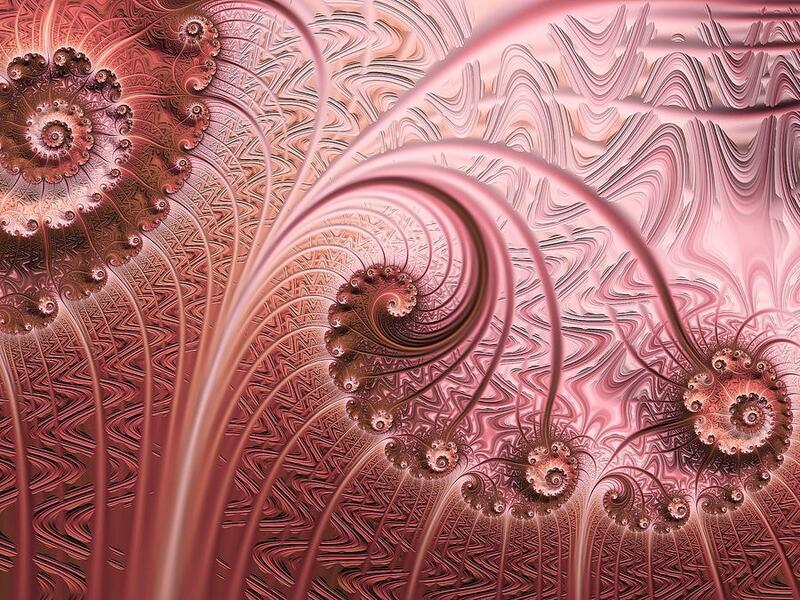 Please visit my Conceptual Fractal Art gallery to see all my math-based designs. I'll certainly give you credit for inspiring this mathematical breakthrough, but I'm thinking more about the Ig Nobel prize. That works. My father always said my headstone would read "She was good at Trivial Pursuit." 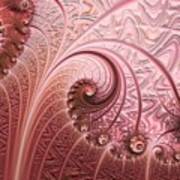 Mathemastication? Y'know what you did for me, Susan? You inspired me to invent a whole new field in mathematics and logic and to produce its first proof. I'm prepping The Mayor for a gallery performance as The Prof with a salute to education and that's got to be a training aid. I'll also officially introduce the paradox that has turned the math world literally upside down, the Hendrix Conditional: "If 6 was 9...?" Remember where it all started when you win the Nobel! Today's lesson in mathemastication. Three points make it plane that you have an angle: 1. Real women have Bell curves. 2. You are no standard deviant. 3. You're off the R Square Pi Chart. Therefore, you are not straight. Oh come on... what's the point of being a deviant if all you can muster is standard? Love it when you get all frisee. When you get angly you're very cube. I am acutely aware I can be obtuse at times. Now, don't be bichy. Got your pencil and paper ready? I once held a guinea pig upside down and its I's fell out. Bichy? You say that like it's a bad thing! Well Jim, why don't you tell me what kind of animal YOU think it is? Wait, lemme get a notebook, you can go ahead and lay down on the couch, brb. Love this one Susan... very 'gurly'..
Congratulations on your 3rd Place in a three-way tie for 1st Place in the Digital Floral contest!